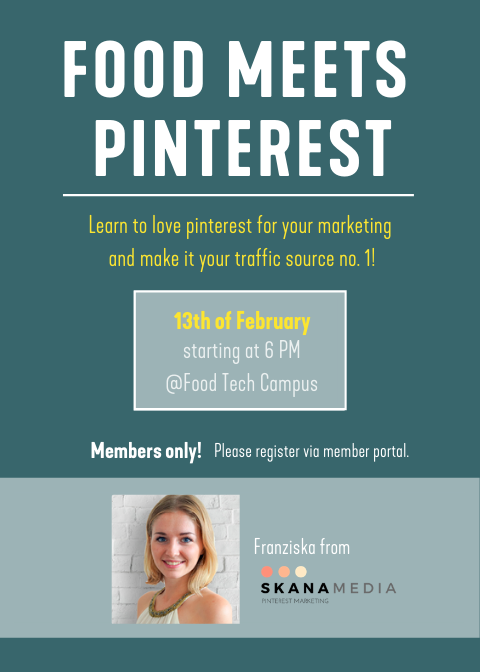 Food meets Pinterest – the traffic booster for your startup! Did you know that Dr. Oetker generates 56% of their social traffics via pinterest? Many people are not aware of how much marketing potencial pinterest can offer for companies, startups, self-employed people and bloggers. Especially for startups that strive for reach and traffic on their website, pinterest as a visual search enigine can be a relevant marketing channel! Food is next to interior design, DIY and fashion one of the most wanted categories on pinterest. Lead Digital describes it in the following way: „Pinterest – the underdog in online marketing“. If you are keen how to use this potencial for your startup, this is the place to be for you! Learn to love pinterest for your marketing and make it your traffic source no. 1! If you want to receive further information to pinterest, visit the website of Skana Media: www.skanamedia.de or send an email to mail@skanamedia.de. Please register via Member Portal.